. This canvas teepee was truly beautiful and expensive. It took me several attempts to properly assemble the teepee, but once it was up, the teepee provided a great enclosed outdoor space to play in and looked great in the yard. The canvas is secured to the ground with tent stakes (not provided). During high winds, the tent stake straps tore on our teepee, and it came crashing down breaking a pole. I repaired the pole as best as possible, as well as the tent stake canvas loops. In the hot California sun, the canvas deteriorated quickly. We stored the teepee under our shop during the wet, winter months. The following summer, the canvas was stained and very weak. The teepee did not survive its second summer, as more poles broke and the canvas tore in many places. I was sorely disappointed, as I truly love the teepee, and it was very expensive. I don’t know if our climate or our storage of the teepee contributed to its destruction, but we can no longer read stories and play in this unique structure. A Hopi friend of mine feels it is inappropriate for children to play in teepees, as they promote stereotypes about Native Americans. Obviously, not all tribes live/lived in teepees; however, they have become a symbolic representation of all native people in America. 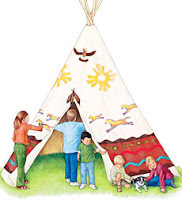 For my daughter, we never associated the teepee with any culture and simply enjoyed the unique structure for play. We did not pretend to be cowboys or Indians. If she would have been older, I would have been sure to teach her about all of the various housing structures utilized by tribes across this vast continent. Don’t forget to read Green Family Values this week! « Green Family Values: Downshifting Week-Slow Down and Green Up! No, I don’t believe they are. We ourselves have a large canvas teepee. Although I do have Native American blood, I wasn’t thinking along those lines when I bought this teepee for my oldest sons birthday. He discovered it a local Ren Faire, parked himself in and quietly played by himself for almost 40 minutes (a lot for a not quite three year old) while I was in nearby stalls so it went home with us. It was heavy duty canvas on two sides, a heavy cotton fabric on the other two sides and the poles are pvc. It has survived a ton. It’s almost always out, and while I didn’t store it properly during winter (it now has some mildew staining) it’s still very strong and has a ton of play left in it. What I had in mind when it made it’s way home was a portable play house. We don’t own our own home, so it needed to easily move. My children have played everything from pirates to Star Wars in it and don’t associate it with “Indians”. As my children get older, they will learn more about their heritage and that some of our ancestors did in fact live in this type of shelter, as well as several other types. I think it really depends on the family and what they teach the child as to how they view it. Glad you found us Jenni! My best friend is Finnish. She has this pair of bark woven shoes that I covet. I would love to see a picture of a Finnish “teepee”.